I was given an advanced copy of this by Netgalley in exchange for an honest review and I can honestly say I am glad I didn’t pay for it. I actually read it a few weeks ago but it’s taken me this long to write a review because it genuinely annoyed me and I couldn’t be bothered to rehash it. Link is the son of two hippy Professors who, after years of allowing him leeway in his education, suddenly force him to go to this prestigious school where the time you take to run around the quad secures your place in the school hierarchy. For a family who prize scholastic achievement it does seem very out of character for his parents to send him to a sports-centric school. Every single aspect of the school from your peers to your future is set on this ranking and, to be honest, that is the most believable part of the story. Link, having gained the slowest time, is bullied relentlessly. No one wants to be in the crosshairs of the bullies so he is friendless. You would have some sort of empathy for him if Link wasn’t such a genuinely unlikable character. Eventually Link tells his parents that he wants to leave school and they only agree if he goes to summer camp for two weeks. 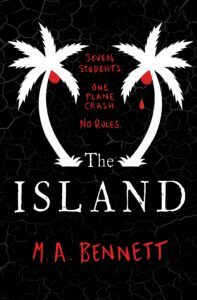 He agrees and is looking forwards to being done with his schoolmates but the plane crashes on a deserted island where the seven characters suddenly have to survive on their own. Because Link is the ‘smart one’ he suddenly has all the power and that power starts to go his head. Cue a role reversal and Link becomes the bully and has to learn that power corrupts. As a synopsis that really doesn’t explain all of the little details about the book which grate and make it a tough book to keep reading. Firstly Link is being bullied and, not only does he not say anything to his parents, but the teachers know and do nothing. In this modern society that was glaringly egregious. Every school, even prep schools in Britain, have anti-bullying campaigns. The very idea of a school as prestigious as that one appears to be without some sort of monitoring is ridiculous. Especially when a report of cyber-bullying can now get you expelled and cause long-lasting career repercussions. The author spends the first almost 100 pages telling us how much Link loves his parents and how much of a great relationship they have and yet for THREE YEARS they don’t notice he’s being victimised? Secondly Link himself is unlikeable. We are supposed to feel sorry for him but his inner thoughts are not those of a victim. They are of a burgeoning psychopath. When he lands on the Island he rejoices because he thinks his bullies are dead. He has not even one ounce of distress over the death of classmates. There was supposed to be a pilot and a stewardess and he doesn’t even think about them. When he gets power he uses it to belittle and humiliate his fellow survivors and he justifies it with how badly he himself had been treated. He forces the girls on the island to wear a short skirt and serve him and, if they refuse, then he starves them. He holds the power of life and death over his peers and he relishes their complicity. He’s desperate to be needed and in control. He reminded me, quite honestly, of the insular, misogynistic, entitled men you find at comic con who believe that it is their interests, rather than their personality, which gets them bullied and that everything they do is justified because of their ‘suffering’. His change into a power-hungry tyrant really did not come as a surprise to me as he had already exhibited many of the danger signs. The third grating thing was the other characters in the story. There is the jock who has been bullying Link, his popular swim-team girlfriend, a closeted gay guy, a streetwise yes-man, an overachieving Asian girl and an emo girl. Ah, references to the breakfast club and its list of stereotypes gets quite a lot of mentions but, unlike the Breakfast club, these characters ‘layers’ are almost as stereotypical as their initial roles. The jock is only as secure as his leadership role, as soon as anyone else has power he becomes irrational and petulant. The popular girl is secretly insecure. The gay guy is in love with the jock. The streetwise guy is actually pretty decent under it all. 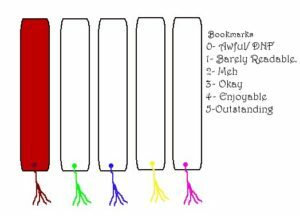 The overachieving Asian girl is overwhelmed and close to a breakdown and the emo girl is actually deep and smart. None of these layers or stereotypes come as any kind of surprise. In fact the best thing I can say about the book is that it is all so predictable. The ‘twist’ at the end was not only obvious but spelled out in a way that was almost insulting and the epilogue was just plain ridiculous. This book is also going to be dated very quickly. It has so many pop-culture references that jolt you out of the story. The main one being all of the LOST comparisons. In fact, thinking back, this feels like LOST fanfiction. As a fan of the show the fact that the airline was called Oceanic Airlines, the fact he had the same seat number as Jack and the metallic hatch all felt like direct rip-offs rather than clever homages to the show. I didn’t like it and I felt it was a struggle to read.